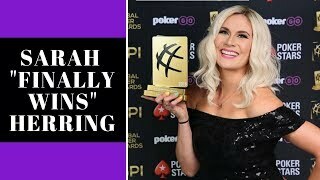 Sarah Herring finally takes home the coveted Global Poker Award while poker player Maria Ho had a surprise win over Nick Schulman for Broadcaster of the Year. A short recap of a few of the Global Poker Award winners, as well as other news from the poker world. First, two big winners from the Patrik Antonius Poker Classic in Estonia. Next, the winner of the partypoker MILLIONS Live Rio Main Event. After that, we tell you who won the World Series of Poker CIrcuit Main Event at Bally’s in Las Vegas. And, finally, we are happy to report that poker player and four time World Poker Tour champion Darren Elias is safe after an attempted armed burglary in his home. Articolo precedente Kalidou Sow entra nel team dei PokerStars Ambassadors!